For the third time this month, I'm going to do a performance of the Beethoven Missa Solemnis, this time at the Oregon Bach Festival. I'm down in Eugene, Oregon doing rehearsals this week leading up to our performance on Friday. I haven't been here for two years, so of course it's lovely to be in Eugene, see old OBF friends, and be making music under Helmuth Rilling. As if those experiences aren't enough, there has been even more music-making! I was so excited to collaborate with my amazing wife Abby to do a concert last week. For the first time ever, we presented a concert/sound therapy event together. It was called "Summer Centering" and we did a wide variety of music, including Snow Patrol, John Lennon, Greek chant, The Civil Wars, and some music I wrote. 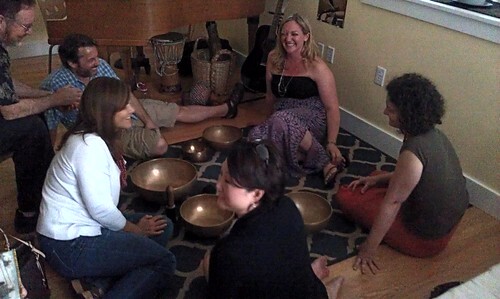 And the real centerpiece was Abby's performance on the singing bowls she trained to play in Nepal. Lastly, I've gotten a little behind on my composition project, but I managed to get into a practice room at the University of Oregon today for my latest idea (recorded just with my laptop). For some reason, ragtime was speaking to me this week! I've posted Idea 20 below. It's just some ideas I'm trying to flesh out right now. I'm currently asking the question: how can music be beautiful and touching without being excessively cheesy or corny? So here is one attempt on that topic. In other news: I have returned not long ago from a European tour with Cappella Romana, but I'm actually headed out of town again this week. I'll be singing at the Victoria Bach Festival in Victoria, Texas and then running up to Austin, Texas to repeat the performance. This is the same conductor as Conspirare, Craig Hella Johnson, and we will be performing Beethoven's massive and powerful work, Missa Solemnis. This will be my first time performing this monumental music, and in just a couple more weeks, I'll get to repeat the experience performing Missa Solemnis with Helmuth Rilling at the Oregon Bach Festival.